Lately it’s been bugging me that WordPress requires users to enter Alt and Title tags each time an Image is used in a Post or Page. Other Content Management Systems I’ve used (i.e. Adobe Experience Manager) allow users to upload their media assets in one central location, and manage all metadata properties in that single authoritative place. Properties set there are then read by all components and meta tags that need them, and the same consistent metadata is used across the entire site. I searched the Internet for plugins or code snippets where other people had accomplished this paradigm with WordPress. Unfortunately I came up empty handed, and decided to create a quick plugin to do this myself. The plugin was fun to write, an essentially combs through a post’s raw HTML looking for <img /> tags. When it finds a tag, it will determine the image ID, and use that to look up the image’s Alt and Title values set in the Media Library. The Alt and Title values are them pumped back into the HTML and sent back to the Browser. When modifying the post’s HTML, did it make sense to parse the HTML into a proper Document Object and make manipulations using setter functions, or just stick to simple String manipulations? Parsing the entire post’s HTML into an Object and then back out to an HTML String leant itself to unintentional modification of the HTML nodes, classes, attributes, etc. I feared that taking this route may lead to compatibility issues by breaking other WordPress plugins. Instead I opted to comb the broader post HTML with Regex, and only convert the localized Image tag HTML strings into Objects for manipulation. Determining Image IDs from their HTML output was difficult – in order to look up an images Alt and Title tags from the database, I needed the image ID to know what record to refer to. Unfortunately the ID is not output into the Image HTML tag by default. I ended up using the image src URL, and comparing it to the post’s attachments (made accessible by WordPress OOTB functions) in order to determine the ID. This method isn’t perfect however, because some Image Optimization plugins (e.g. EWWW Image Optimizer) can modify the image URL during optimization. I ended up submitting this plugin to the official plugin directory on WordPress.org and they accepted! For reference, the code snippet and readme file contents are below. Hope this helps someone out there! Description: Automatically populates Alt and Title tags for images using the values set in the Media Library. Automatically populates Alt and Title tags for images using the values set in the Media Library. 1. Upload the `img-alt-media-library` directory to the plugins directory of your theme (usually `/wp-content/plugins/`). That's all, you're good to go! Upon viewing your posts and pages, you should now see image Alt and Title tags being pulled automatically from the Media Library. This plugin hooks into the the_content filter on page and post render. 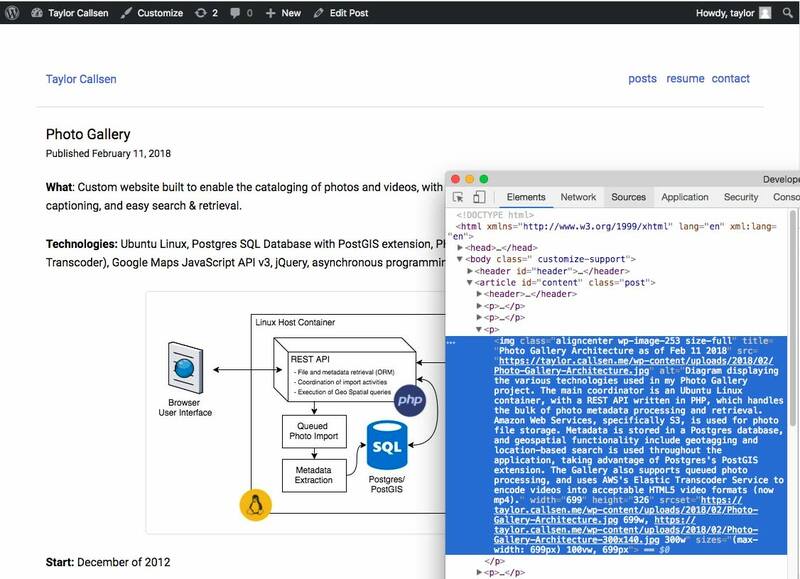 Essentially right before post_content (in the form of raw HTML) is set to the browser, this plugin will scan the HTML for  tags using a regex matcher. Regex was used instead of parsing the HTML into a Document Object to maximize compatability (parsing the HTML into a Document Object, and then back to an HTML string would likely modify the HTML syntax, drop attributes, etc. which could break other components and post functionality). 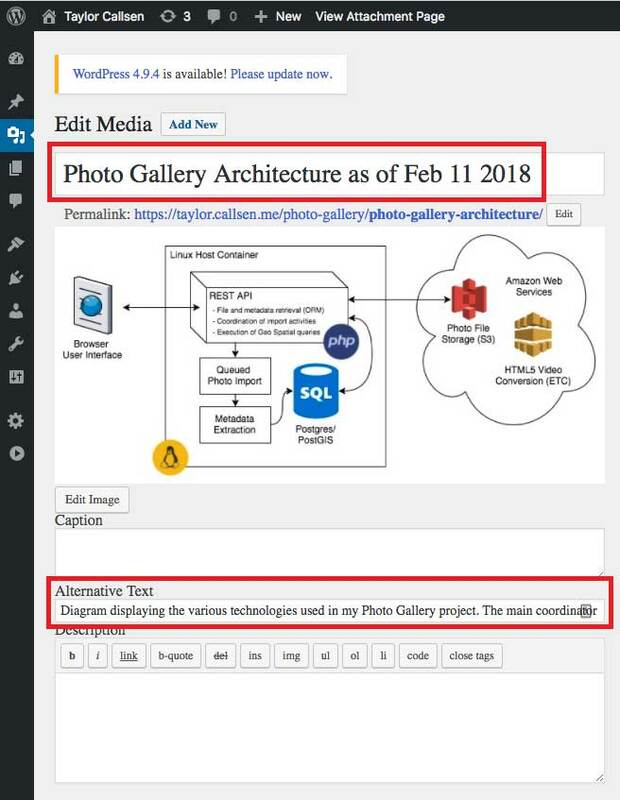 Once the image ID is determined, the plugin retreives the image Alt and Title values for that attachment using the get_post_meta() and get_the_title() WordPress functions. Once these values are returned, they are added to the image unless the image already contains an alt or title tag, in which case this part is skipped.